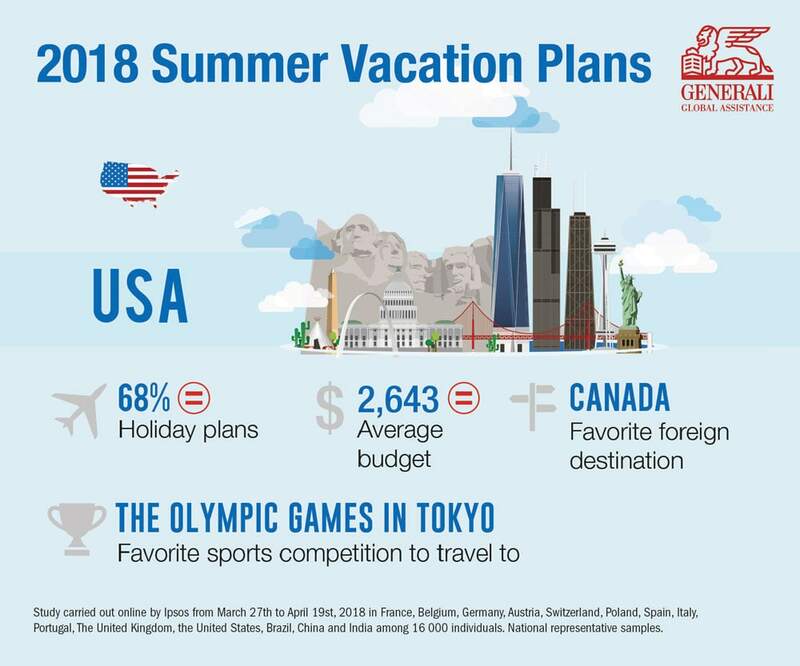 Generali Global Assistance’s Travel Insurance division (“the Company) today releases its annual survey findings on vacation plans for U.S. travelers. The survey found that more U.S. travelers will be packing a bag and heading out on a summer vacation – 68% up from 61% in 2016. Americans were tied with Brazilians as the most likely to travel, ahead of the Chinese (67%) and Europeans (64%). This year, budgets for U.S travelers declined modestly by one percentage point to $2,643, while average trip duration increased modestly to 1.5 weeks. Nearly half (46%) of U.S. travelers will book their trip at least 4 months in advance. Relaxing tops the list (54%) which explains why they are much better than Americans at unplugging completely from work – 66% of Europeans vs. 55% of Americans. And the Chinese who will be the most connected group, with only 31% spending less time than usual on social media. 29% said they would engage in a free home exchange (vs. 16% of gen pop). Online reviews (33%) – which increased from 31% in 2017. For Americans, Paris and London topped the list of cities they would most like to visit at least once. Europeans would most like to visit New York and both the Brazilians and Chinese have Paris atop their wish list. The 2020 Summer Olympic Games in Tokyo was the most attractive sporting event to attend, followed by the Super Bowl and the U.S. Open (tennis). Generali Global Assistance offers a full suite of innovative, vertically integrated travel insurance products and assistance services that help protect consumers against certain risks associated with travel. These products combine the institutional knowledge, quality, and customer service built by CSA Travel Protection over the past 25 years with the backing and underwriting ability of a global insurance brand – Generali. To learn more about Generali travel insurance plans, please visit GeneraliTravelInsurance.com. The 18th edition (3rd for the U.S.) of the “Summer Holiday Plans” survey was conducted by Ipsos on behalf of Europ Assistance and Generali Global Assistance between March 29 and April 19, 2018. The survey was conducted online for 16,000 consumers in 14 countries, with 1,000 consumers taking the survey in the U.S.